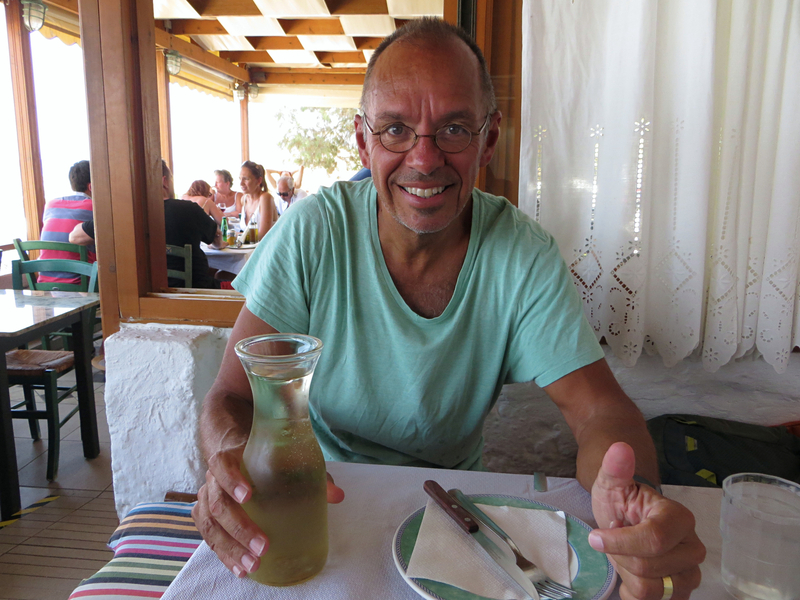 After saying goodbye to the Germains, Mark & I started off on what we expect will be a slow journey through some of the Greek islands we’ve never been to. Traveling without reservations over the high season is a bit challenging, so our itinerary has more to do with where we can find nice hotels with vacancies than some strategic route through Greece. 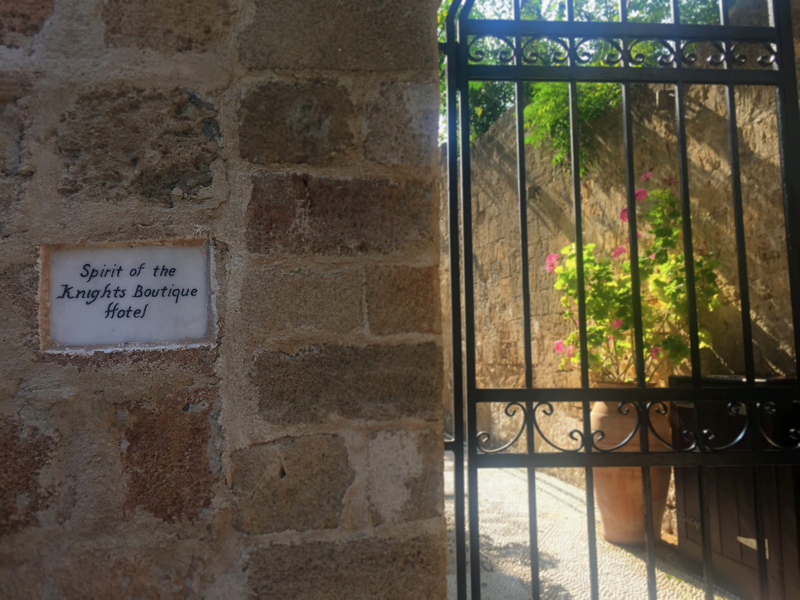 So with a little research we found what we thought would be a nice little inn on the island of Rhodes (pronounced ro-dos, not roads as one might think), an island in the far southeastern corner of Greece, much closer to Turkey than the Greek mainland. 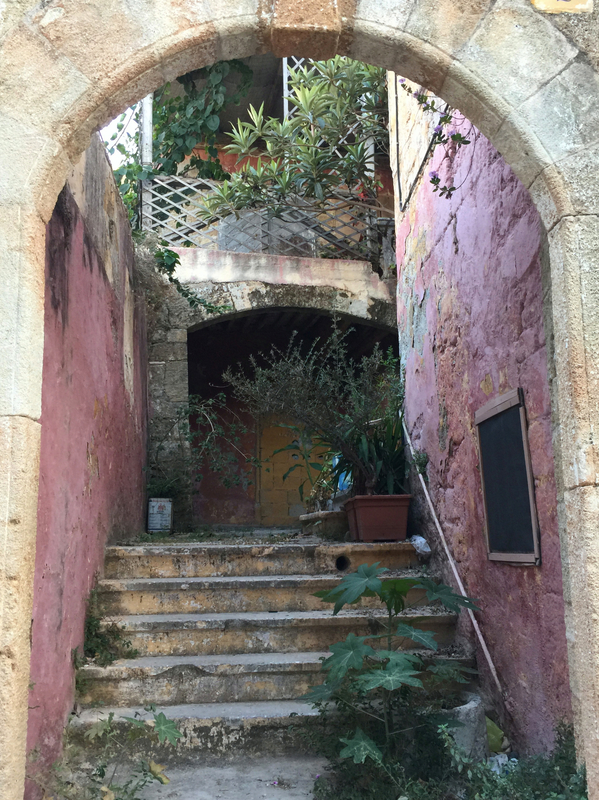 The island has all the great history you’d expect for this part of the world – allied with Athens, then Persia, then back to Athens, and later Sparta, before swinging back to Athens again. 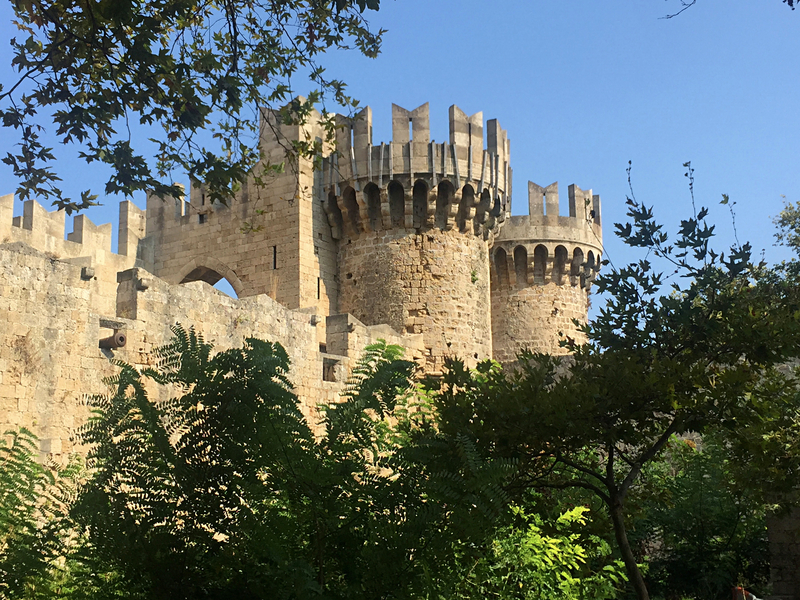 Like everything else in that part of the world, Rhodes became part of Alexander the Great’s empire and, after his death, became one of the most powerful islands in the Aegean. To celebrate their prominence the people of Rhodes built a 100-foot statue to honor Apollo, known as the Colossus of Rhodes, one of the Seven Wonders of the Ancient World. The statue was said to be so tall that large warships could sail under its legs into the harbor of Rhodes, though it appears that’s more myth than reality. Unfortunately, a few decades after being built at the start of the third century BC, it was felled by an earthquake; nothing is left of it today. 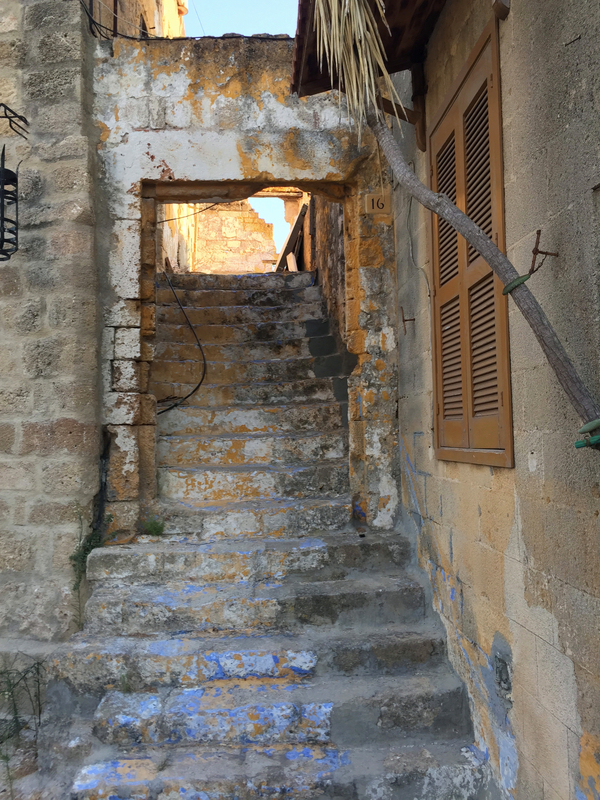 The next interesting part of the island’s history was in the early 14th century AD, when the Knights of St. John arrived after being evicted by Islamic forces from Jerusalem. 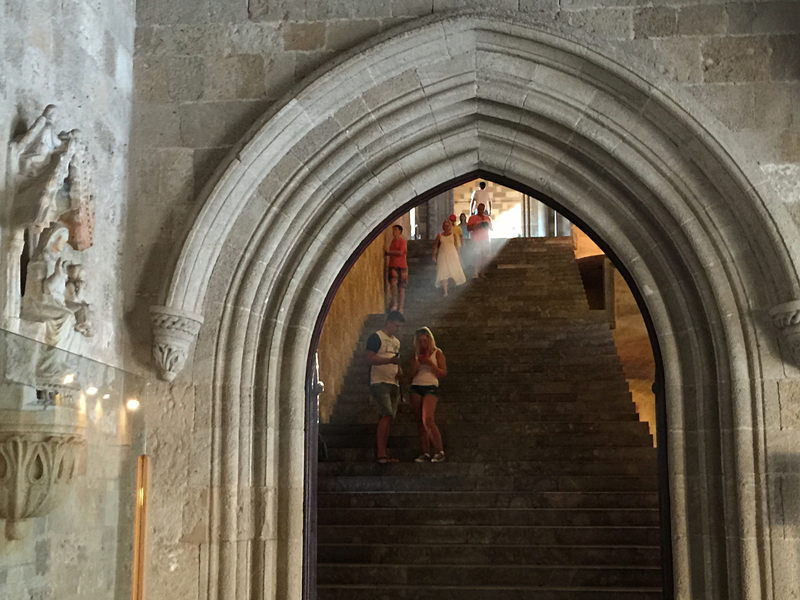 They remained on Rhodes for over 200 years, building what are now fabulous medieval ruins, until the Ottomans forced them out. At that point they moved on to Malta, building more great castles and towers that we visited last summer. 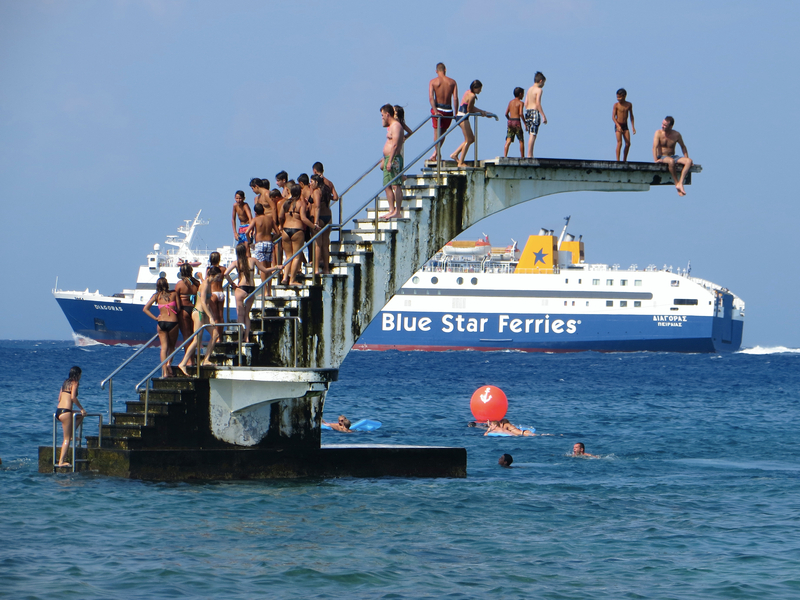 With that background, then, we boarded a 13-hour overnight ferry from Athens down to Rhodes. 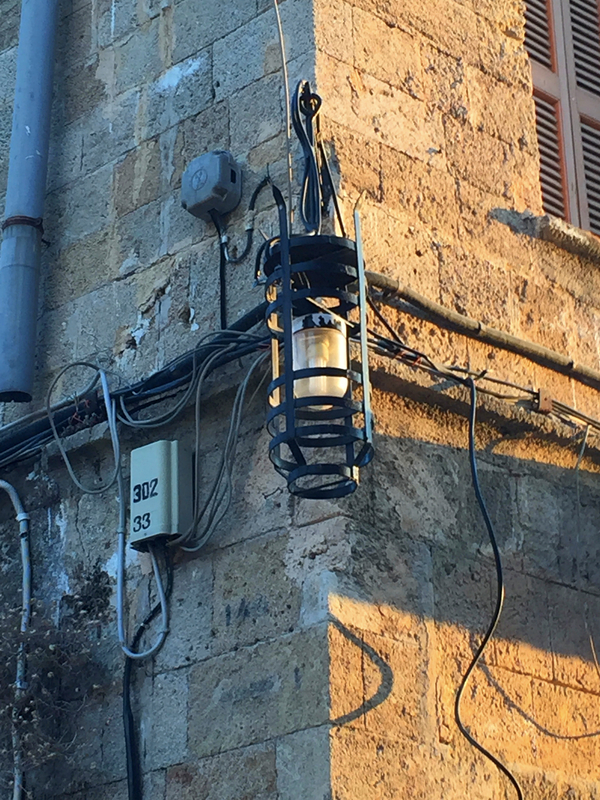 We’ve done a few overnight trips in the Mediterranean, and they’ve run a gamut from pretty nice to barely decent. This one was great – nice restaurants, nice cabin, great night’s sleep to the rumble of the ship’s engines and the rocking of the ship. We were both surprised by how many people – hundreds of people – sleeping on any chair or clearing on the floor instead of taking a cabin. It reminded us how lucky we are to be able to travel in a little more comfort than most people. 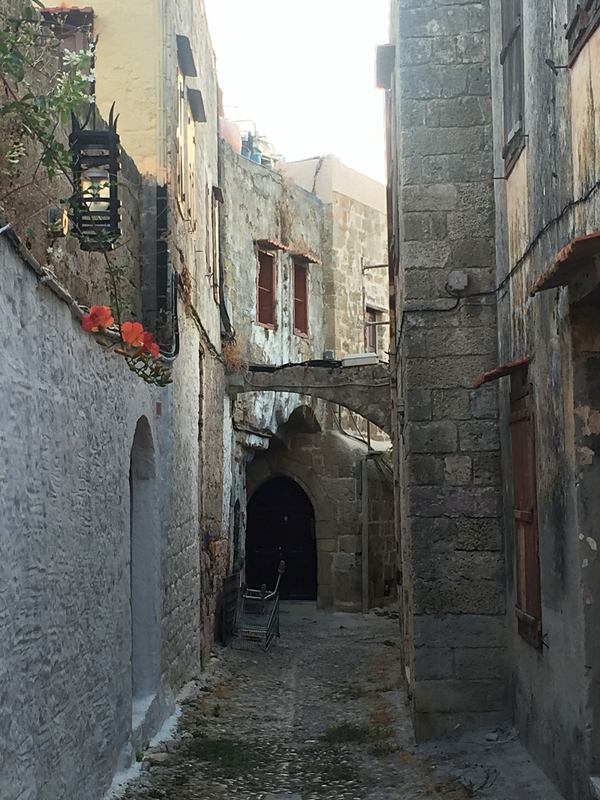 When we got to Rhodes, then, and saw our little hotel down the cobbled streets of old Rhodes Town, we had a better sense of just how lucky we are. 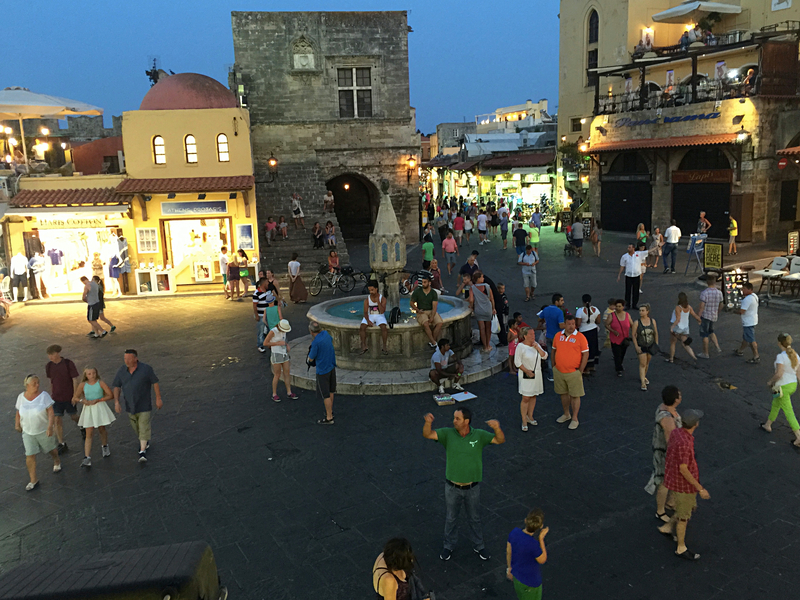 Simply put, Rhodes Town was fabulous, just about the most perfect place we’ve stayed in 27-plus months of our nomadic life. 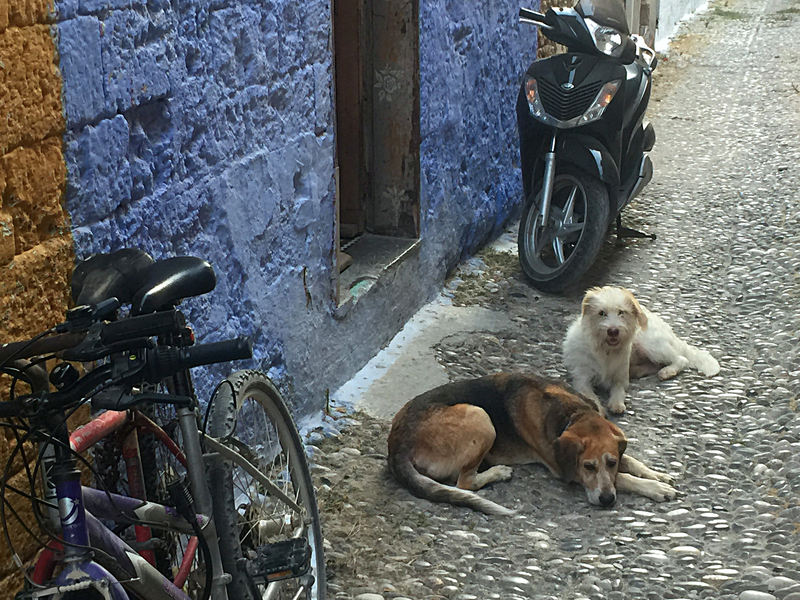 The old town is a stunning mix of winding streets, ancient walls, bougainvillea, modern shopping, restaurants, bars – you name it. It is said that the old town is the only place in Europe with the old city walls fully intact. It seems you could wonder through the streets for days finding new hidden treasures. 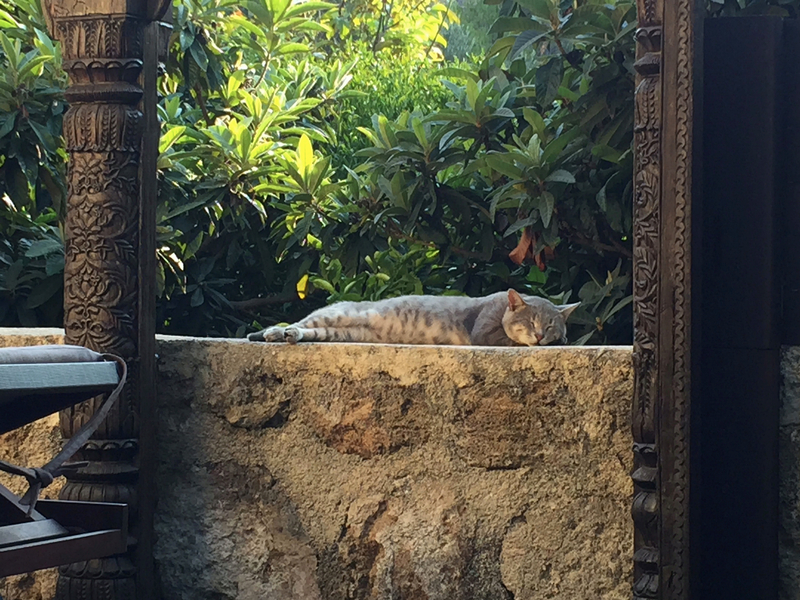 That’s Earl Grey lounging in the hotel courtyard. 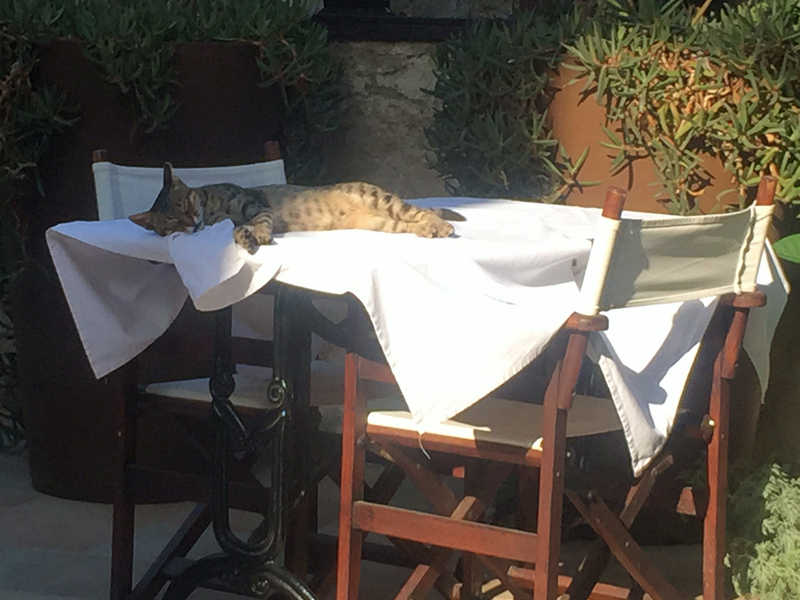 She joined us every morning for breakfast, and we saw too it she wasn’t starving. Our hotel, Spirit of the Knights Boutique Hotel, is really one of a kind. A dozen years ago it was just one of many 400-year-old ruins that dot the region. A British family decided they could make it into something, and boy were they right. Today it’s one of the nicest places we’ve ever stayed. 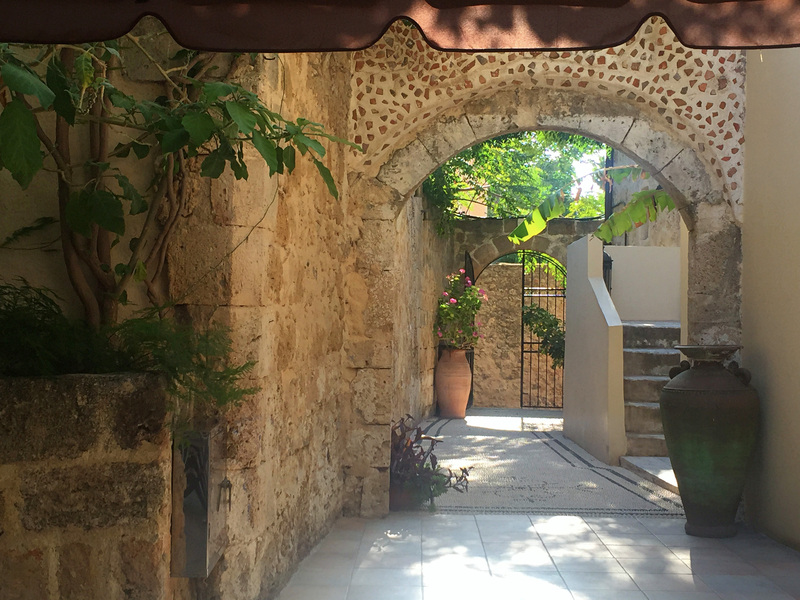 Tiny, but with a beautiful courtyard where breakfast is served. (Breakfast was great, but the highlight for me were the small fresh figs newly available at the start of the all-too-short fig season.) There had been two rooms available when we made our reservation, and we prudently chose the less expensive room. Imagine our delight, then, to hear that they’d upgraded us to the nicer suite, with its own 400-year-old private hammam. It doesn’t get better than that. Except it kept getting better. With a beautiful old town and a great hotel, what else do you need, right? 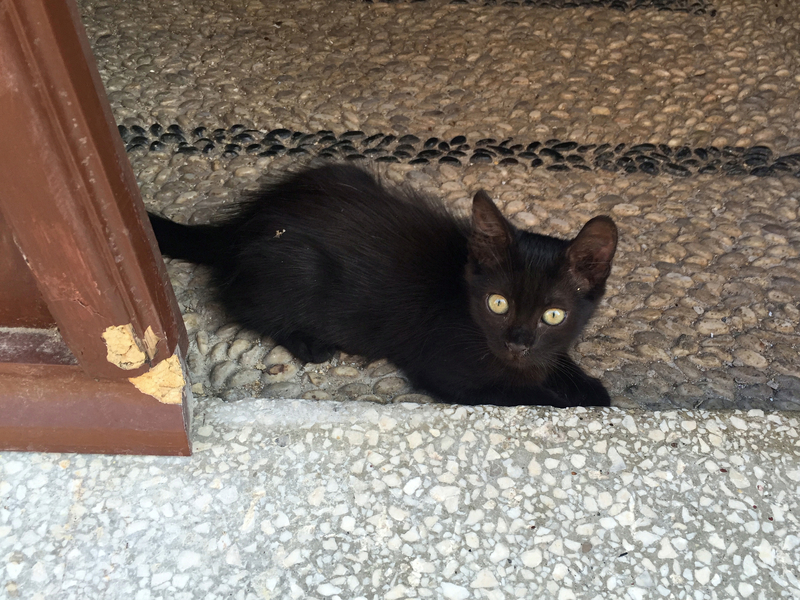 How about cats? 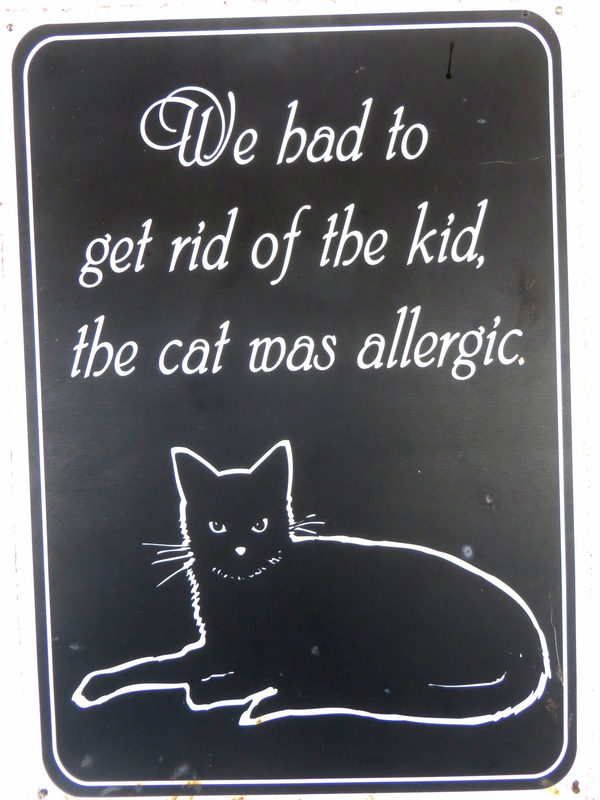 Yup, lots of cute kitties on the island. And then there’s that gorgeous sea nearby. So add to all that a beautiful beach with a great beachside restaurant. Yeah, that too. It was a 20-minute walk through the old town, across part of the new town, and then you’re on the beach. You can’t say enough about a Mediterranean beach and the beautiful water. 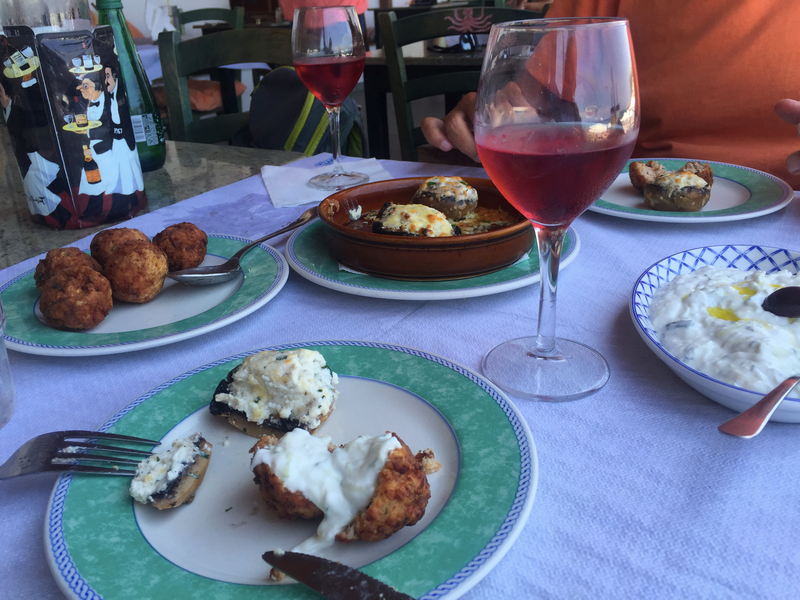 But when it’s accompanied by Greek food and the best bottle of a local rosé, then you’re in heaven. 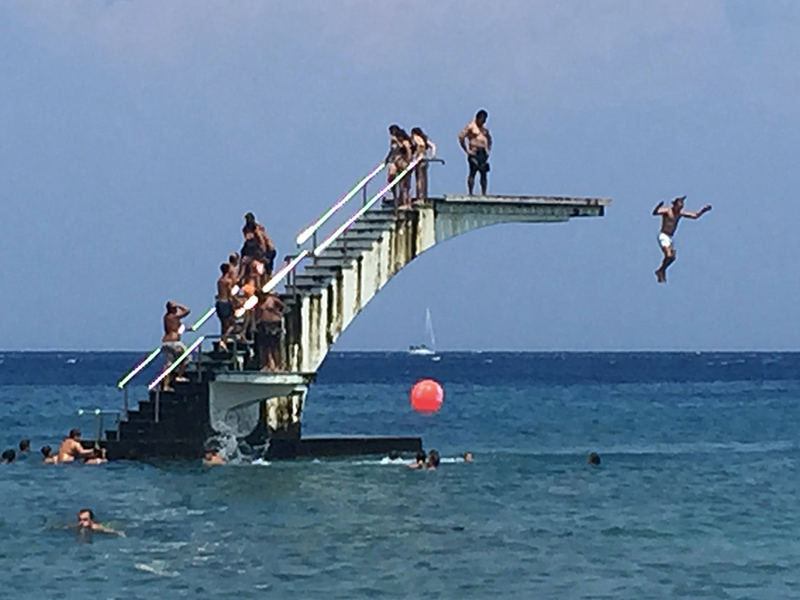 The beach in Rhodes Town includes this diving platform just offshore. And yes, Mark & I both jumped off that 20- or 25-foot platform into the Mediterranean. Sweet! 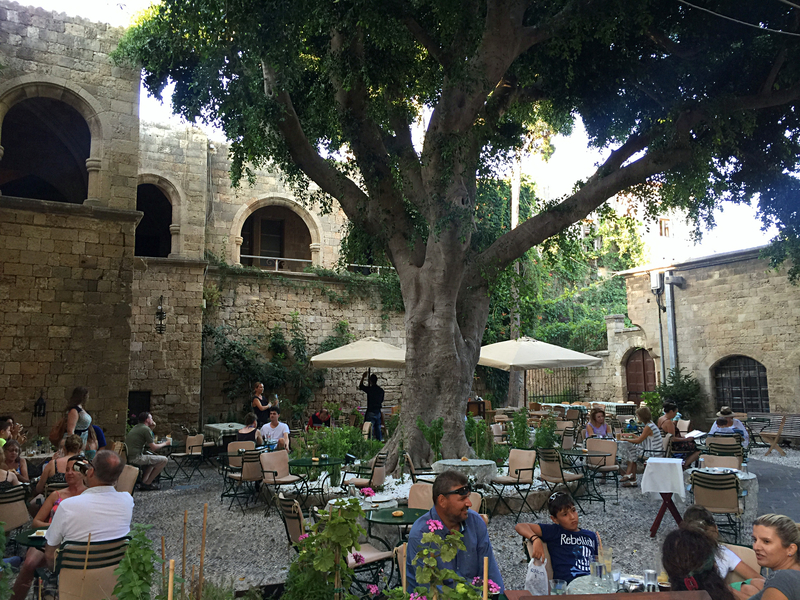 So that was our time in Rhodes – a gentle early morning reading in the courtyard, a great breakfast (those figs! ), a pretty walk to the beach, swimming, reading, lunch (tzaziki, that rosé! ), more swimming and reading, and then back to the old town for cocktails and dinner. Life is good, and more than just about any place I’ve been in years this is a place I want to come back to. Yeah, I probably say that a lot, but Rhodes really is exceptional. From here we’re staying on the island a few more days, heading south to another tiny little town and what’s supposed to be another great beach. Then we’ll see what else is available in the area. 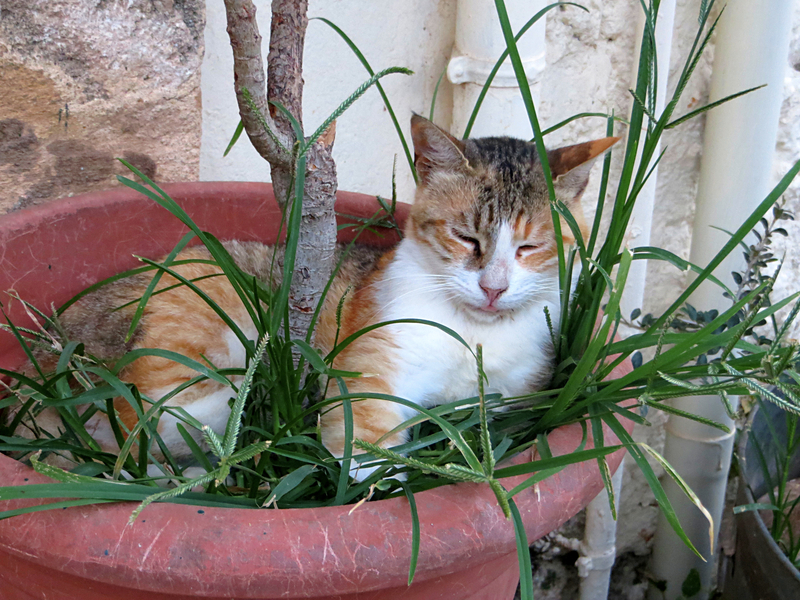 If you can’t tell, so far at least we’re enjoying this little jaunt in the eastern Mediterranean. 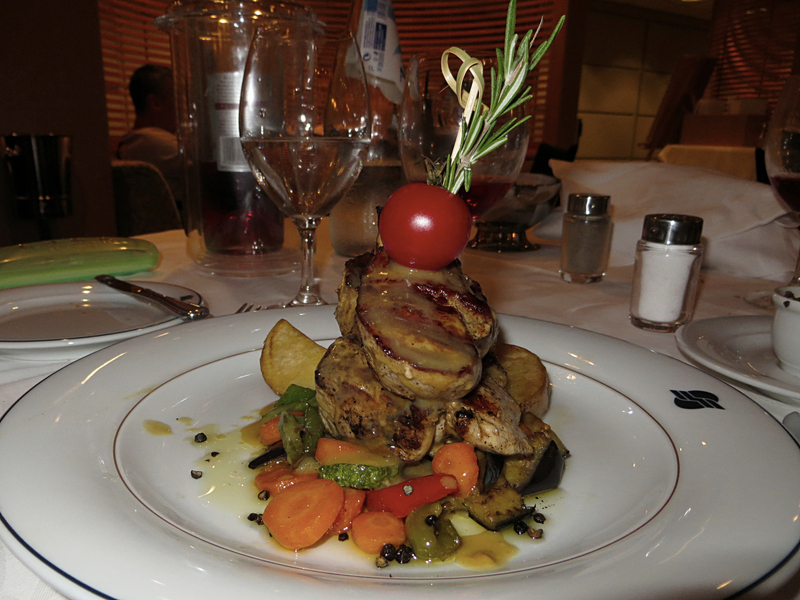 This was dinner on our overnight ferry to Rhodes. We didn’t expect such elegance, but it was fun.